"Why are you here?" "I had a run in with a space alien." 20th Century Fox has debuted a new TV trailer, a 60-second spot, for Shane Black's new The Predator movie. We only just got the very first teaser trailer for this a month ago, and it's scheduled for release in September, so it's good to see some more new footage here. The big reveal in this is that there's a second Predator that appears out of nowhere at the end. What in the hell…? The ensemble cast is lead by Jacob Tremblay, who "accidentally triggers" their return to Earth again, along with Sterling K. Brown, Yvonne Strahovski, Olivia Munn, Lochlyn Munro, Thomas Jane, Boyd Holbrook, Jake Busey, Keegan-Michael Key, Niall Matter, Trevante Rhodes (from Moonlight), plus Edward James Olmos. Looks good. You might want to check this out - it's a cool reveal. 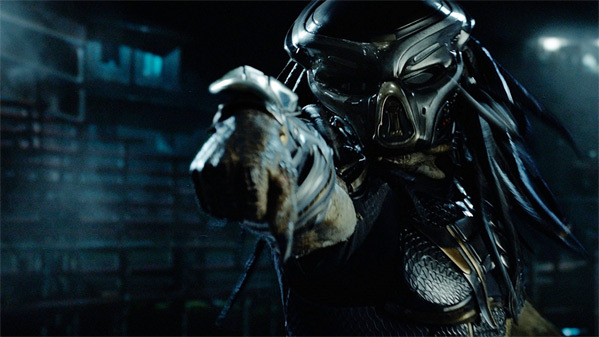 You can still watch the first teaser trailer for Shane Black's The Predator here, to see even more footage. From the outer reaches of space to the small-town streets of suburbia, the hunt comes home. Now, the universe's most lethal hunters are stronger, smarter and deadlier than ever before, having genetically upgraded themselves with DNA from other species. When a young boy accidentally triggers their return to Earth, only a ragtag crew of ex-soldiers and a disgruntled science teacher can prevent the end of the human race. The Predator is directed by American filmmaker Shane Black, director of the films Kiss Kiss Bang Bang, Iron Man 3, and The Nice Guys previously; as well as a talented screenwriter. The screenplay is written by Fred Dekker (who directed The Monster Squad, Night of the Creeps) and Shane Black. Fox will release The Predator in theaters everywhere starting September 14th this fall. Your thoughts? Any better?